In my last story I wrote about how Elon Musk is revolutionizing the concept of transportation though Tesla, Boring, Hyperloop and SpaceX and how this plays together with drone delivery and blockchain. Today I’ll take a second look at “self-employed cars”. Before we go there, we will cast a cursory look at current trends to understand what tech enables this coming revolution. If you took a Taxi in Berlin in the 90s, everything went the following way: You call the taxi station and order a taxi to your location. Some minutes later the taxi arrives. You paid cash or via credit card. In 2010 MyTaxi was founded in Hamburg — a smartphone app that lets you order the taxi, confirm with the taxi driver, receive an estimate of when the taxi arrives and, crucially, allows for payment in-app (via credit card or PayPal). During the same timeframe Uber Cab was founded (2009–2011), now called Uber. While most of you know it, I’ll give a short intro for those who don’t: Uber is is a community platform where privately owned cars and their drivers participate in a network of car owners/drivers with those who need a lift. It’s a platform which outperforms taxis, mytaxi and other platforms by price and service. Uber lifts are not only half the price but the service is more personal because of the ratings given by the users of the platform. Every driver and every passenger is rated, therefore good service is key to be booked as a driver or accepted as a guest on the platform. Uber is experimenting since 2015 with self driving cars. They got a fleet of volvo cars which were specially equipped for self driving purpose. They are by no means the only ones jumping into the field of self driving cars. The most famous is Tesla again but others like Google and Apple are working on self driving cars as well. While the technology is still in its early stages the medium (3–5 years) time frame will ultimately lead to self driving cars as a standard. The advantages are by far bigger than the disadvantages. You can dedicate your time to something else like working, reading or sleeping. For platforms like Uber a huge cost disappears — the driver. Car utilization can be brought up to a maximum. No sleep for the driver means more driving hours for the car. Self driving cars will replace taxi services and Uber drivers. The next step will be the uber fleet owned self-driving car fleet. But if we are willing, we can go two steps ahead and estimate the outcome. 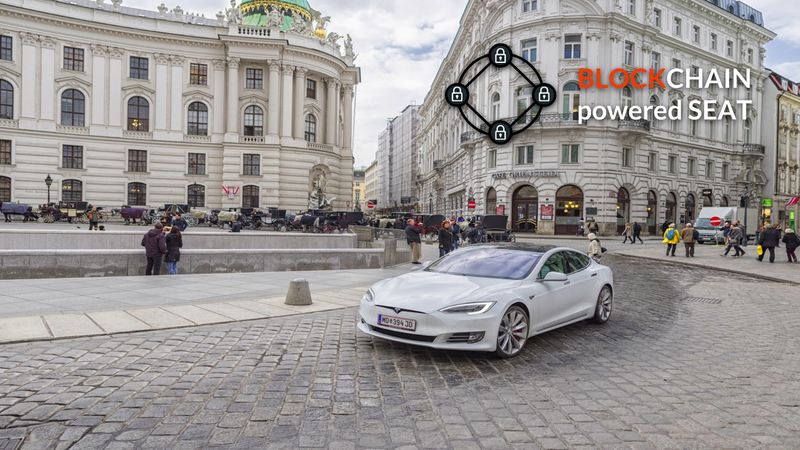 With blockchain technology it becomes possible to have a self employed car. What do we need for this? Scalable Blockchain technology for Smart Contracts, micro-payments and Digital Identities. Let’s speak about SEAT “Self Employed Autonomous Tesla Car” Note: This is indeed Tesla advertisement I get nothing for. Elon Musk’s inspirational powers are enough to support him here. We will see how SEAT’s can transform public transport in cities. The SEAT requirements: To get started with a SEAT we need some requirements set. First of all we need an initial investor for the car and a group of people willing to ‘gift’ that car to itself. A good way to do that would be to create a Foundation for safer and greener public transport in major cities which follows the goal states in the title. The goal of the fictional foundation would be to reduce the cars in the city to the amount of cars needed at peak utilization during the day. That number plus the number of cars in maintenance and a small redundancy in case of crashes or break downs is the total amount of cars needed for that city. Another goal should be to reduce costs to a minimum (therefore a non-profit foundation) and optimize the traffic service. This could happen through machine learning models and anonymous usage statistics. how many cars were requested at what time and how long was the average arrival time for that car? Companies like Uber already have major experience how to use gathered data to optimize delivery time and availability of the drivers. Let’s speak about the cost structure and the business model. Some things might be odd for you — why the heck is a foundation needed? The reason is simple: the market rules have changed. Once autonomous cars can deliver the same or better services like a traditional taxi company or Uber, the costs per drive will be reduced greatly. If two companies would both offer the same service, but one would be a profit company and the other a non-profit company. Both would have the same efficiency but the car service of the profit company would always be more as much more expensive as the percentage of the profit fee. Therefore a company willing to reduce that margin will undersell and win the customer. This leads to a downward spiral and ultimately to a zero-margin model. It’s easier to directly implement it into a business model, so that the ultimate goal is full autonomous while continuously reducing costs by automating tasks. Coming back to SEAT. We now spoke about all the components to get started. The initial investment will therefore be done by the foundation which can be publicly funded or funded through crowd investment. First step would be to set up the infrastructure needed and buy an initial fleet of several SEAT’s to support. Paying it self off: After the SEAT is bought it will start its service. The SEAT itself is ordered like a taxi in Uber or MyTaxi and is payed. This will put the car in a competitive price range to compete on the market. Where does blockchain come into play? Like often it is not about all the obvious things but about the underlying trust infrastructure. For the SEAT to act as it’s own company it needs to be able to represent itself through an Digital Identity. In addition it is required that the SEAT is able to do and receive payments (has a Wallet). 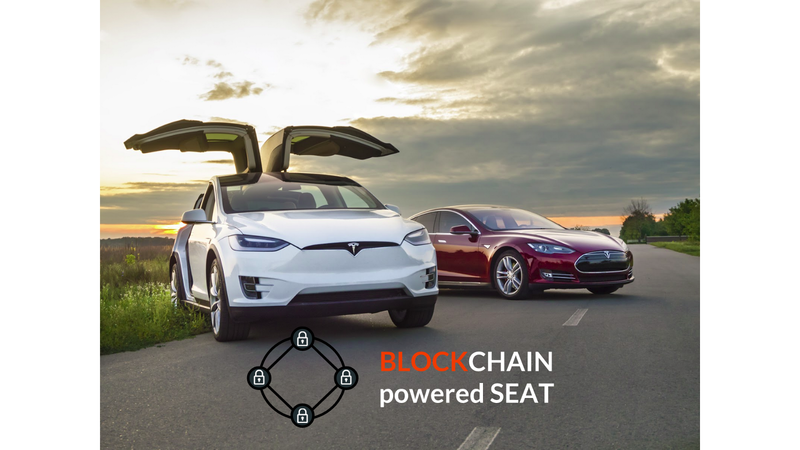 For services the SEAT needs to be able to utilize Smart Contracts for insurance, security services and most importantly ride bookings. Let’s jump into an user experience. You might remember Mr. Keller from my last story — he is a business guy and just landed in Berlin and wants to reach a customer meeting with a SEAT. With his app he books a SEAT available on the airport — during the booking process he already selects his target to reach and made a small deposit to ensure that his booking is binding. This allows the SEAT to estimate the time of arrival and look for a subsequent booking. Through the reservation system pre-bookings can help to minimize the waiting time and availability. Mr. Keller is heaves his luggage into the trunk and begins his journey. The moment he enters the car, the car verifies his identity by visual confirmation or shared secret in combination with his Self Sovereign Identity. He is now paying per meter driven and per minute spent in the car with a micro-fee. While Mr. Keller is driving with the SEAT to the customer location, Mr. Keller receives a phone call that the location of the meeting was moved to another building. Mr. Keller is informing the SEAT about the change and continues with his journey. All information about his ride is transparently displayed in the car — ETA, estimated price and traffic conditions. Safety is another important aspect, therefore the SEAT is equipped with various sensors to monitor the outside and inside of the car. If Mr. Keller would fall ill the SEAT could call an ambulance and even take the fastest route to get medical care. In case the car is attacked or involved in an accident the service foundation and the policy could be immediately informed thus increasing safety for Mr. Keller. At the end of the ride, Mr. Keller confirms his arrival at the final destination. He already sets up a reservation for when he leaves the meeting. The payment is done “automagically” the moment the door of the SEAT’s closes and Mr. Keller confirms the end of the ride. The crypto-funds from Mr. Keller’s wallet are transferred to the wallet of the SEAT. The amount is specified in the Smart Contract. Now the SEAT is ready to approach the next customer ride nearby. More Blockchain: Maintenance and cleaning are done via Smart Contracts by contractors. Supervised by the service foundation. I mentioned insurances before, right? These are Smart Contracts as well. Etherisk is already looking into the first use cases today. Every booking itself is directly connected with the identity of the car as well as the customer (in this case Mr.Keller). If Mr. Keller decides to cancel a ride after ordering one, this is also combined with a fee, this will provide an incentive to Mr. Keller not to cancel the ride without a good reason. A feedback system encourages the customer to keep the car clean and in good shape. If any side recognizes anomalies the service contracts are executed. With increasing self diagnoses and sophisticated sensors the SEAT becomes very good in assessments if it needs repairs. This will lead to clear definable maintenance tasks which can be handled by offers through Smart Contracts. The workshops than get paid directly after the cars recognizes that the maintenance task is completed. Blockchain can help to ensure that only spare parts of the designated manufacturer are used through signed parts. Where the record of the part is given (where it was when produced) and verifiable. In perspective the workshop can be fully automated, especially if the same car models are used. Alerts of any anomalies can be registered on the blockchain as well. Helping to find reasons for accidents or anomalies. In case you’ve asked yourself — The SEAT is a fictional abbreviation I came up with for fun. Let me know what your thoughts are, leave a comment or a constructive feedback to improve the article. You want to know more about something, let me know as well.